Lady Crane wows the crowd w/ her speech at Joffrey’s death. She then patches up Arya, feeds her (something NOT so yum), and they have a nice convo before Arya goes to sleep (thanks to Milk of the Poppy). Essie Davis shows her motherly side, BUT is also funny and sassy. Four jerky guys are messing around by a campfire when The Hound attacks w/ his big axe (yikes)! There’s another new priestess in town… and she’s a black woman. (We need more meaty characters on this show who are POC!) The people in the streets are now peacefully going about their business. 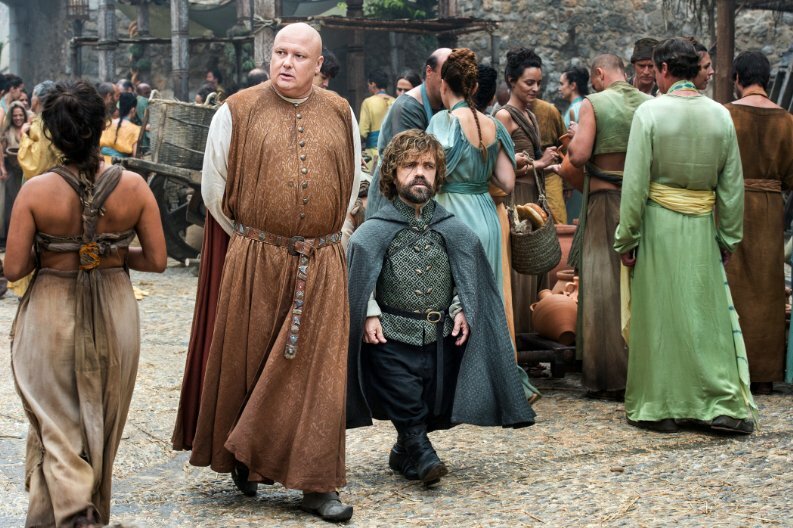 Varys is going away (on a secret mission, of course); he and Tyrion have a little goodbye scene. Varys, the most famous dwarf in the world. -Tyrion corrects his friend. 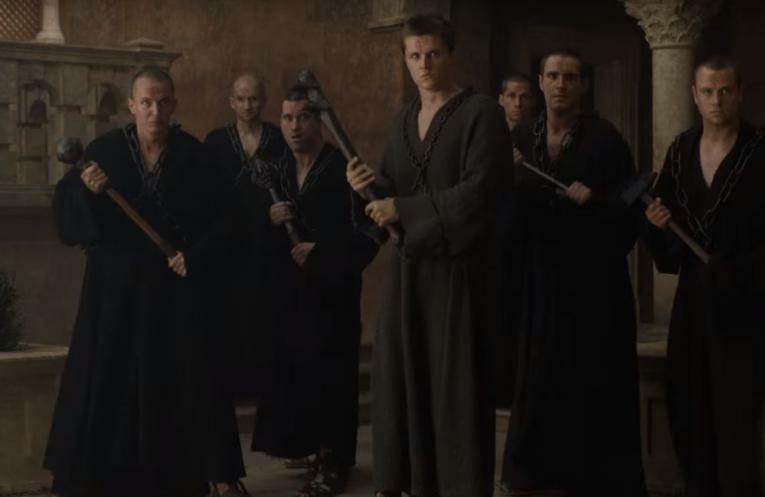 Lancel and a small group of Sparrows are allowed into The Red Keep (thanks to Tommen, of course). But The Mountain VERY brutally kills the first man who strikes his chest w/ a spike! Brienne and Pod are high above the siege on a ridge, looking at the red tents of the Lannister army. 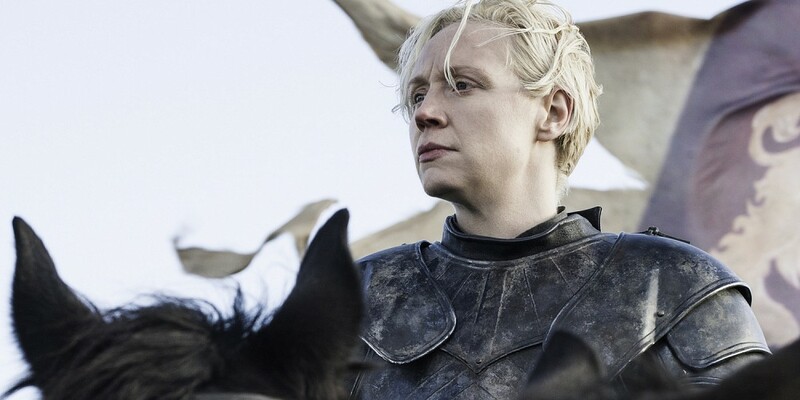 Then Brienne spots Jaime riding among the crowd of soldiers on that FAB white horse of his. For a few moments, she just stares at him lost in her own thoughts, unaware that a few soldiers (w/ the red and gold banners) are riding up behind her. We get a SUPER fun scene w/ Pod and Bronn (LOVED it)! Bronn wonders if Brienne and Jaime are hooking up (LOL- that’s what MANY viewers would like to see!!!) It’s obvious to the former sellsword that she’s got feelings for him. Then the scene I’d been waiting for the MOST- Brienne and Jaime talk re: politics, military strategy, and honor in his tent. You can tell more from their looks than from their words; those two are definitely in a complicated relationship. She tries to give him back the Valyrian steel sword (Oathkeeper), but he insists it was always hers (aww). Seven hells! 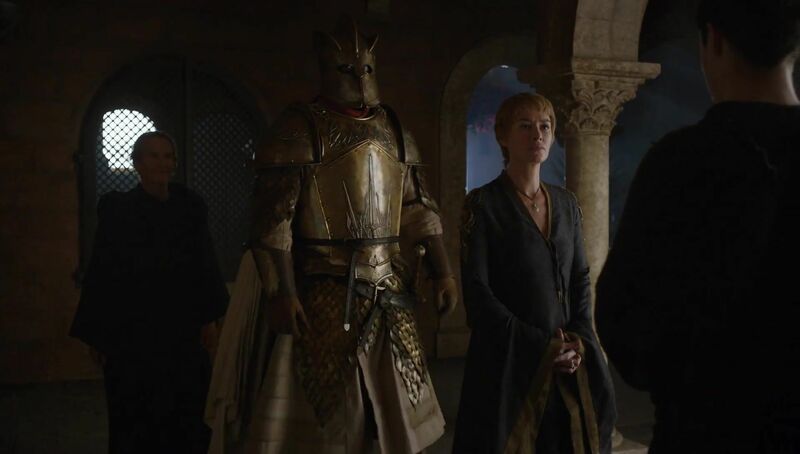 After her uncle, Kevan, relegates Cersei to the gallery w/ other ladies (instead of standing by her son’s side), Tommen proclaims that trial by combat is now “forbidden in the realm.” So, Loras and Cersei will be judged by seven septons. 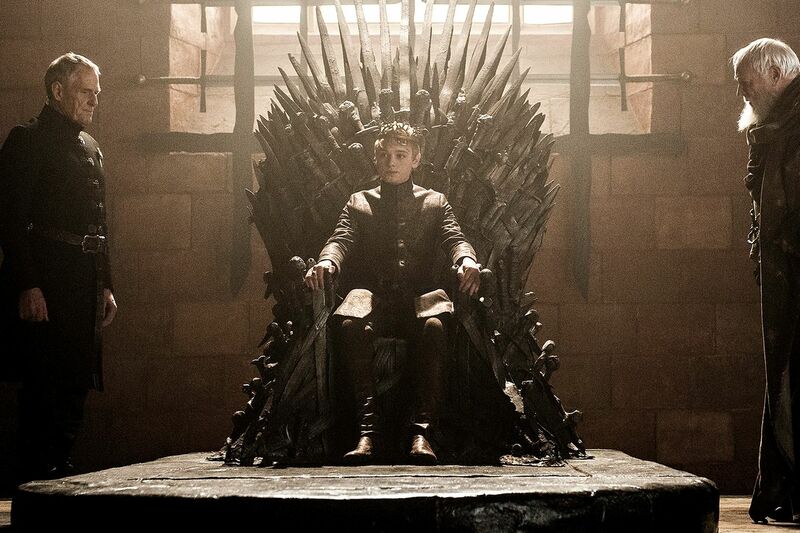 Tommen is TOTALLY in the pocket of the High Sparrow now! Oh no, poor Tyrion is now trying to get Grey Worm & Missandei to drink wine and tell jokes. Ugh, just NOT an effective (or even mildly funny) scene! Peter Segal (Nerdette) was VERY disappointed w/ this ep, particularly this scene. We get another FAB scene- this time it’s w/ Jaime and the (still imprisoned) Lord Edmure Tully, who is the heir to Riverrun. Tobias Menzies finally gets to reveal more of his character. It turns out that he has a son (whoa); you can tell he wants to protect him badly from the pain/anguish in his eyes. Edmure wonders how Jaime can sleep at night after ALL the killing he’s been responsible for over the years. Jaime deflects the convo to Catelyn- her love for her kids and how much he admired her. Cersei is the same way, he explains, and he’ll do ANYTHING to get back to his sister. You’ll serve Sansa far better than I ever could. -Blackfish tells Brienne w/ admiration before going into a fight w/ the Lannister men (offscreen). The Blackfish dies fighting (offscreen, unfortunately) after Edmure surrenders to the Frey & Lannister armies. Um, how can you see someone wave at you in the fog when it’s nearly pitch dark!? Writers missed the mark there (like Edmure w/ his arrows at his dad’s funeral seasons back). 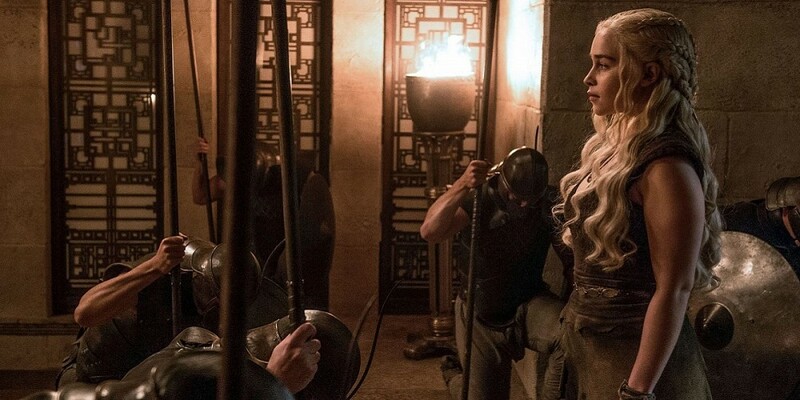 Dany is back… w/ her dragons, BUT it’s rather anti-climactic. The masters are attacking the city from their ships- this is VERY cool CGI. 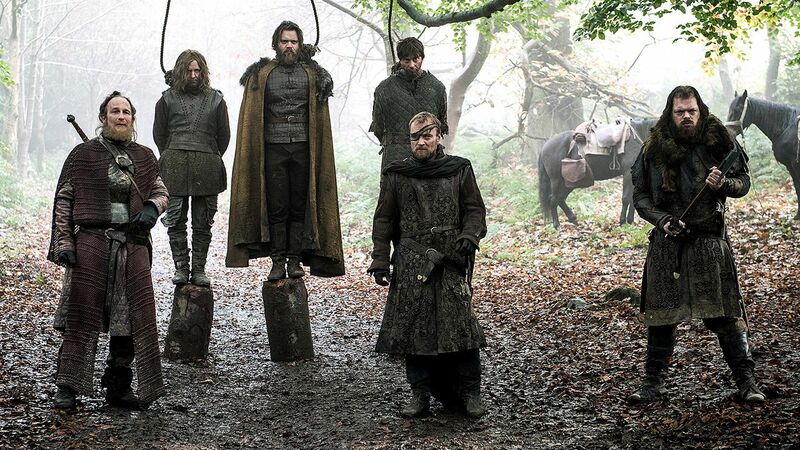 They let him kill (BUT only by hanging) two of the three rogue men who killed The Hound’s friends (including Brother Ray). There is some good dialogue w/ dark humor in this scene- taking a man’s boots while he’s still wriggling in the noose, mention of chickens, & talk of religion. 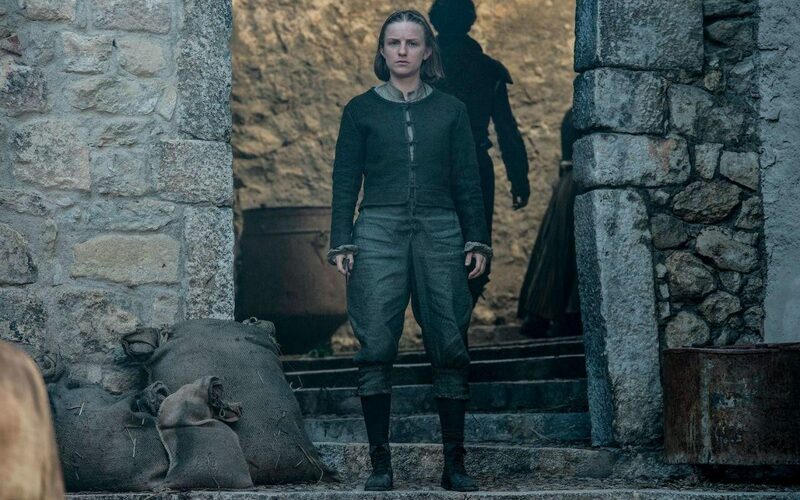 Lady Crane is killed (somehow) by The Waif) before she and Arya have their (Terminator or Bourne Identity scene, as Joanna Robinson joked) through the alleys of the city. How can Arya be healed this quickly!? Finally, Arya tricks The Waif (who’s running like the T1000) into following her into her room in The House of Black and White, then cuts out the sole candle! Jaqen shows Arya his admiration (silently), then lets her go. She has learned a lot and killed The Waif (who was sent to finish her off). YAY, she can reclaim her true identity, now go back “home,” and maybe even fight (Ramsay/the Whitewalkers) along w/ family.